This is my matte finished, Jet black Czech glass, single decade hand rosary. If you would like to get more information about what colors and parts are available in this price range, please contact me. Hand rosaries are used just like the old Irish Penal Rosaries from long ago. The difference is a hand rosary has the complete lower section, where the Irish Penal rosaries only feature 1 decade, 1 Pater bead, a ring and a crucifix. 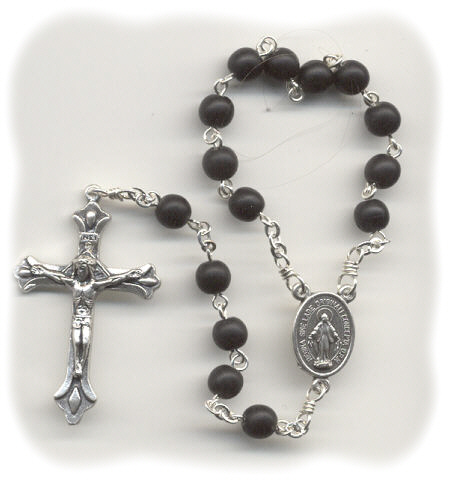 In this case, the center acts as your Pater bead for the upper half of the rosary. When saying the 1st decade, place the rosary around your thumb using the center as your Our Father bead. The 2nd decade is said while wearing the rosary around your index finger and so on (one decade per finger). I originally created this design for a customer who's mom couldn't handle a full size rosary due to arthritis. The smaller size made it perfect for her. Unlike store bought rosaries, I use bows instead of jump rings for added durability.